I can not believe that I have been blogging about raw food for 6 months. 183 different raw food recipes in 183 days! My goal is to reach 365 different raw food recipes in 365 days and as the wintery cold of Melbourne weather approaches I am starting to crave slightly warmer foods! A whole new adventure begins! Combine the cashews, coconut meat, agave, coconut water, 1/4 blueberries and lavender in a blender and blend until smooth. Pour into an ice-cream maker and freeze according to the manufacturers instructions. Add the remaining crushed blueberries during the last 10 minutes. Serve immediately or freeze. I must say that if you want something dreamily smooth and soothing to the soul, this ice-cream has to be it. 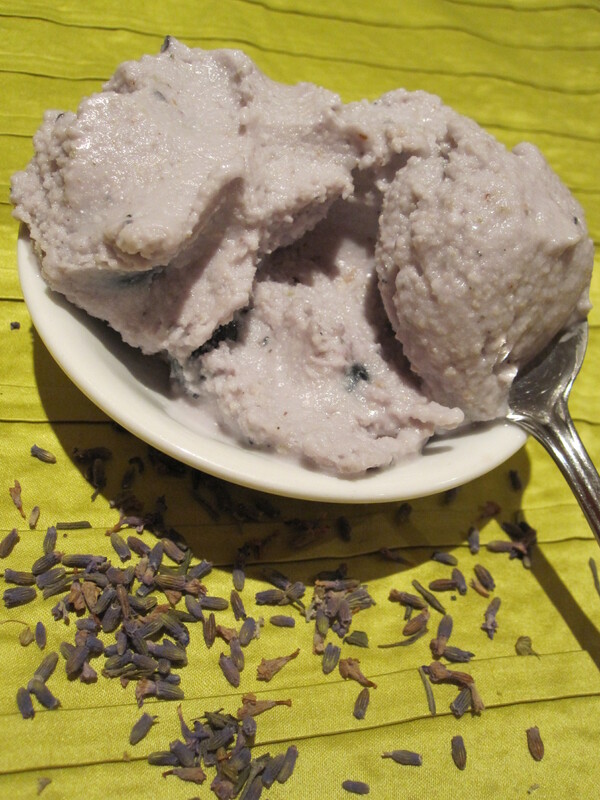 Creamy, light and with that dreamy relaxing lavender, you could literally melt away to another place eating it! After a meal, a small 1 scoop serving of this ice-cream would have to absolutely be the perfect accompaniment to relax you into the evening. it is really helpful for me, thank you for sharing such helpful blog. i really need this type of tips , i just love food and more when it is healthy and tasty recipes .